Spring touring preparations are now in full swing. Over the winter, conversations between my touring buddies (Shawn, Steve, and one other maybe) and me were occasional with no particular sense of urgency or excitement. But now, as April has almost passed us by, there are only three more weeks until we roll out of Red Wing, Minnesota to start the 2015 Lake Pepin Three Speed Tour. We are in the midst of that delightful eager anticipation wave, and we realize there are time limitations for our preparing. So today seemed like a good day to clean up my Quickbeam a bit, and convert it from its recent fixed wheel configuration back to three speed mode. There are a couple of things different for the bike this year. I’m thinking I’ll probably go with drop bars. 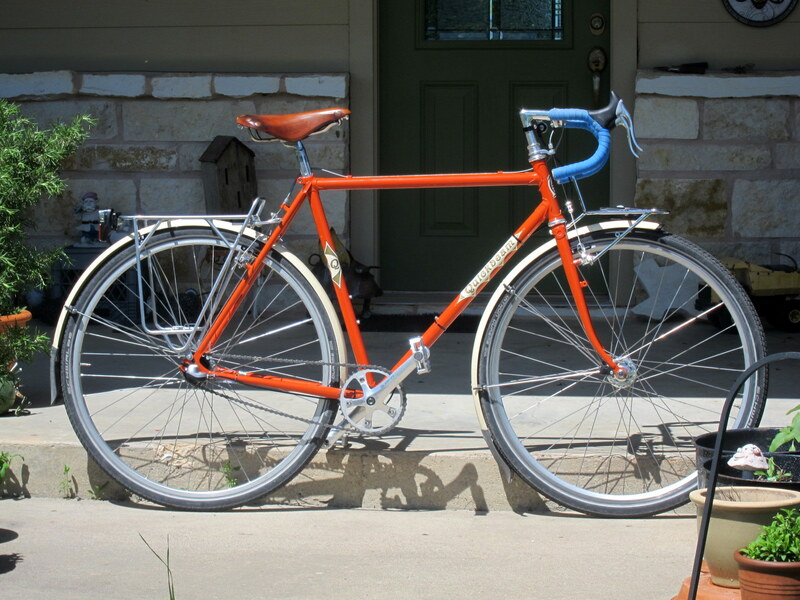 Instead of only a Carradice saddlebag, I’ve added front and rear racks. The bar difference is simply a whim. I’ve enjoyed the drops when the bike was in fixed wheel mode, and just don’t feel compelled to convert back to albatross bars just yet. The racks were added because me and the boys are planning a three day self-supported tour out of La Crosse, Wisconsin immediately after the Lake Pepin event. So this configuration should help me carry along all my creature comforts. Today’s post tinker session test ride gave me one more dose of eager anticipation, and I’m almost giddy. I’m envious. I have to miss Pepin this year, and the additional tour sounds like it will be even more fun. Take lots of pictures! Well…I’m disappointed for you, and disappointed we won’t have a chance to catch up a bit. I had hoped you might join our post-Pepin tour. 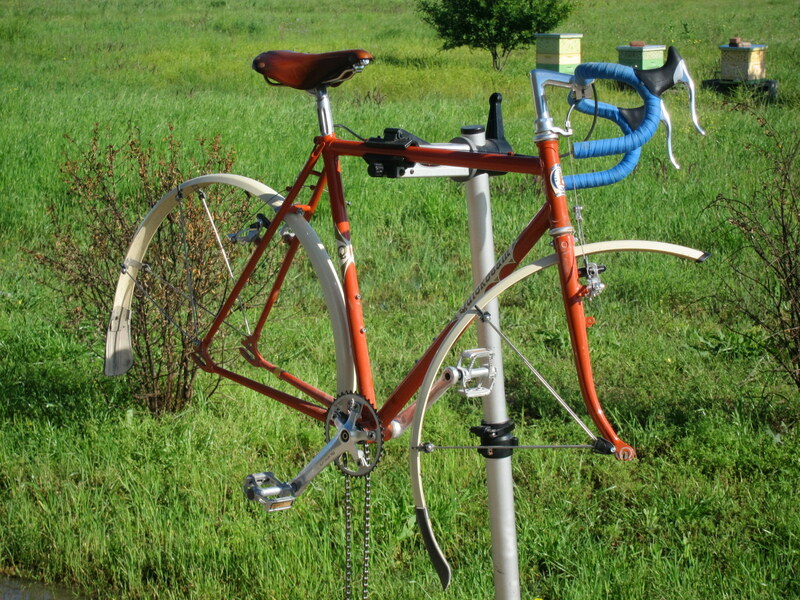 I’m always tempted to get a three speed wheel for my bike just to do this tour. One year, I think I shall. Looking forward to reading your report about the tour and the pictures, Chris! And, Have a Beautiful Day! Have a great time on your tour(s) Chris; it’s almost here! Much thanks! I’m obsessing about what to take with me in these last few days, but it’ll be time to relax and live with whatever decisions are made soon enough. Watch this space for after-reports. Just heard on the radio about a tornado in your neighbourhood- hope you and yours are OK, and all around. Thanks for the note of concern. We probably missed all the tornadoes by 3-4 miles, endured a lot of rain (over 6 inches for the weekend), and lightening struck my house and took out my washer. We came out better than many and are grateful. All quiet today, but the forecast for the next few days…is for more thunderstorms.